We’ll have much more time for full comparisons later, but since we spent some time with the new Moto 360 (2nd gen), we thought we should at least show you how it compares to last year’s original Moto 360. There aren’t a ton of differences, but Motorola did upgrade this new watch in a number of ways over the original release. For one, the watch body now has lugs. Whether you like the look of them or not, Motorola says that this allowed them to increase battery size and also make it easier to switch watch bands. And that’s true, the battery has increased from 310mAh to 400mAh in the 46mm model. They also added a new quickrelease switch to watch bands, making them much easier to swap out. As for the rest of the differences, well, you have a modern Qualcomm Snapdragon 400 processor in the new model, instead of the 6-year old TI OMAP clunker they put in the original Moto 360. The display resolution has been upped a bit as well to 360×330 (up from 320×290) and the side crown has been moved to the 2-o’clock position. Other than that, you are still looking at 4GB storage, 512MB RAM, IP67 dust and water resistance, Bluetooth LE, and a heart rate sensor. Motorola has stepped up their game in the Moto Maker department, though. This time around, there are some 400 combinations, giving you the power to create the ultimate personal watch. From golds to rose golds to silvers to black metal finishes, metal, leather, or silicon bands, and a couple of different sizes to choose from, the possibilities are substantial. 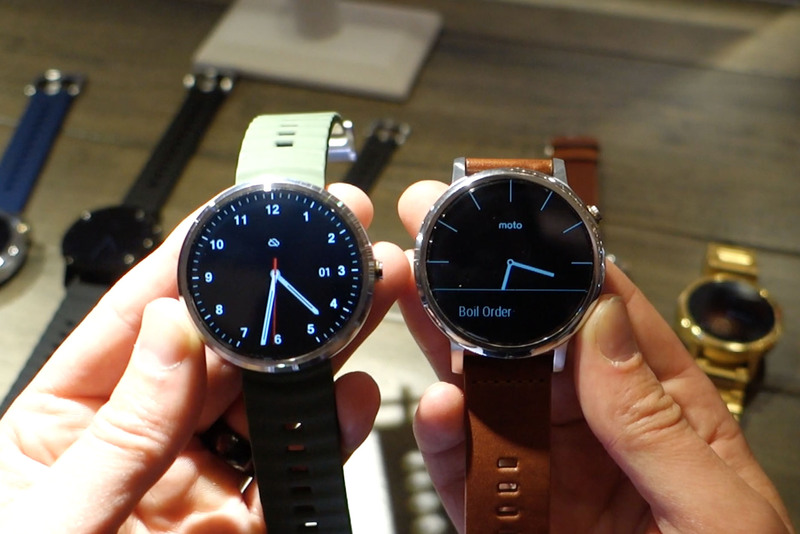 The new Moto 360 (2nd gen) is available for pre-order today with a starting price of $299.